Earlier today, Apple released a statement to several different media outlets in response to reports about the iPhone 6 Plus bending within user pockets, stating that bending from normal use was "extremely rare" and suggesting only nine customers had complained about bending issues. In addition to outlining its rigorous testing policies, Apple has now invited reporters from both CNBC and The Verge to its testing facility to see the machines that it uses to test its products in person. The lab contains an array of different testing equipment, with Apple's head of engineering Dan Riccio telling CNBC the iPhone 6 was "the most tested product we have ever done" and that Apple had not tested another phone as exhaustively. Three-point pressure test image, courtesy of The Verge"As we add more and more features, we have to find out a way to break them before customers do," Riccio told The Verge. According to Apple, 15,000 separate tests were conducted on both the iPhone 6 and the iPhone 6 Plus. "The bottom line is that if you use enough force to bend an iPhone, or any phone, it's going to deform," said Riccio. When asked about the reports of bending, Apple's head of marketing, Phil Schiller, called them "extremely rare occurrences" reiterating to CNBC that out of millions of iPhones sold, Apple had only received nine complaints. He also told The Verge that Apple "designed the product to be incredibly reliable throughout all your real world use." Apple also outlined some of the different durability tests conducted on the iPhone 6 Plus to The Wall Street Journal, explaining that it's subjected to three-point bend tests, which place pressure on the iPhone to ensure it can handle reasonable force, and pressure-point cycling, which places "substantial" force on the enclosure hundreds of times. 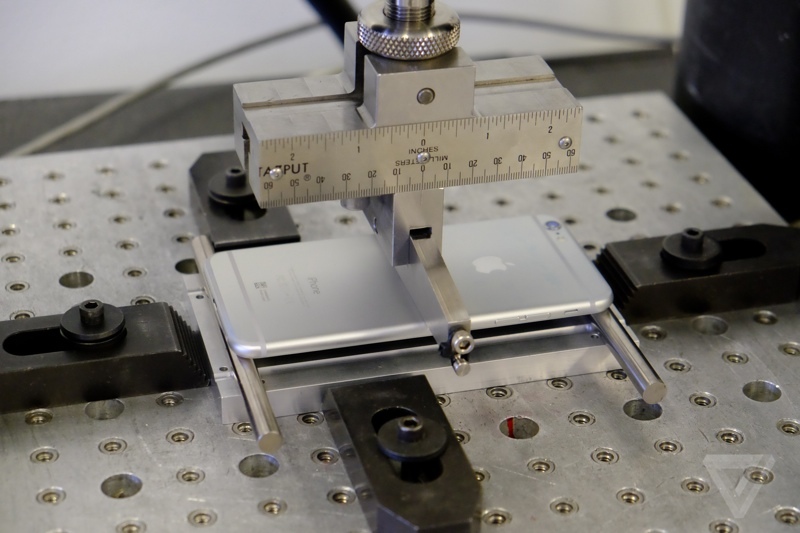 The iPhone is also subjected to torsion testing, which twists and torques the device, and there were sit tests simulating real-life scenarios. Apple pointed to five different tests that new iPhones go through in the development process, including what is known as "pressure point cycling test" when it applies substantial force on the display and enclosure hundreds of times while the phone is held by the sides. Apple said this process bends the enclosure repeatedly to ensure that the iPhone can be bent and pressed at reasonable force throughout its life. Another test, according to Apple, is called the "sit test." This test simulates sitting on a hard surface with the phone in the back pocket of a pair of tight jeans. Apple said it runs the phones through thousands of cycles testing the phone in different positions. In addition to all of the above testing, Apple also tested the phone in real-life, handing iPhone 6 and 6 Plus devices out to "hundreds of company employees" to use in various situations to test for durability and performance. Reports of the iPhone 6 Plus's weakness to bending first surfaced on Monday, after multiple MacRumors forum members shared images of devices that had bent subtly while in a pocket. The bending issue then went viral after a YouTuber posted a video of the iPhone 6 Plus warping out of shape when bent in his hands. Given the significant amount of media attention the bending has received over the course of the last few days, it has been difficult to determine how many users were truly affected by iPhone 6 Plus bending during real world usage. According to Apple, the number of affected users is comparatively low based on how many devices are now out in the wild. Despite keeping quiet on the issue for several days, Apple has directed support staff to replace affected phones under warranty following a visual inspection. "In this case, as in many things, we tell customers that if you think something's occurred that shouldn't have with your device, go to AppleCare, go to The Genius Bar, and let them take a look at it," Schiller told The Verge. "And we'll see if your product is having an experience it shouldn't have and is covered under warranty." Additional photos of Apple's testing equipment and details on the testing process can be found in The Verge's original report on Apple's testing facility. Update: Re/code also visited Apple's testing facility and has published additional photos and a video. I think this whole #bendgate thing is started by Samsung after they saw the succesful launch of the iphone 6 and iphone 6 Plus. I have an iPhone 6 Plus and if it was to bend. I would feel it. The device feels sturdy. And it has that premuim look that Samsung devices will never have. It is not the phone that bends, it is only yourself. 9 people & CEOs of competitors complain. Not much. I sent this email to RIM CEO Jason Chen. Ill report back if he responds. I should add that it if I can't bend it with my bare hands, I will switch from my iPhone to Passport for a year and blog about how great is is at least once a week. Let's admit itwe're a really dumb society constantly in need of stimulation so we sensationalize all these lies. And the Internet (especially Facebook) amplifies everything. Ok, let me explain. The phone will not bend on its own. It takes pressure and force to bend anything, rubber, glass, wood, metal whatever. If someone did have the phone in their pocket and enough pressure was put on it to bend the phone the person with the phone in their pocket would feel it and stop it, or would they? Maybe they were stoned, drunk or had their head up their ace like a lot of people do today. Only the person with the phone in their pocket would know if they were smart enough to not put pressure on the phone. IT IS THE PHONE OWNERS FAULT!! Not the fault of Apple!! Everyone wanted bigger, lighter thinner and they got it. Now put on your big boy pants and take care of your phone! This is one guy who made a video where he bent some phones. How is that qualified to get an scandal? This thing is blown way out of proportion! No invite for cap boy? He simply showed how the iPhone 6+ bent more than other phones. That is good for consumers. Does not matter how he bent it as he tried to bend them all in the same manner, which tells you as a consumer far more than Apple saying we decided it was fine on our test machine. It was about time someone talked about actual engineering procedures. The usual data-less verbal diarrhea was driving me nuts. I'm a reliability engineer and this type of highly accelerated life testing is at the absolute top of the list in any engineer's design checklist. Design for reliability is up there with design for assembly and manufacturability. From my perspective, this gives Apple an easy way to boast about their ridiculously well thought out product design.